Defence Turkey: Firstly, could you please share with us information about Amphenol’s core capabilities and products? Amphenol is one of the world’s largest manufacturers of interconnect products in all sectors within 6 continents, 110 operations, over 240 factories and over 10 million part numbers (Connectors, Cables, Antennas, Sensors). Amphenol has a flexible structure and specializes in interconnect products and is constantly developing in this direction. Amphenol’s biggest strength is the employees who embrace the company as their own. We also have a long lasting 86-year history and solid experience built on a strong foundation and R&D studies. Since 1932, we have continued to grow both organically and through acquisitions that expand our product range. Our local and global distributors operate both by holding stocks of standard products and providing technical support for projects. In order to provide better service to our customers, we continue our efforts to assign sector and product-based distributors. Defence Turkey: How do you asses Amphenol’s position in 2017? What are your goals for 2018? Amphenol grew 8% globally in 2017. As Turkey and the Middle East office, we grew 18%, and we would like to continue to grow by 15-20% in 2018. We address our improvement goals according to customer requests, expectations and needs. In other words, we plan to accomplish our own goals by supporting our customers to achieve their goals. Particularly in the military and aerospace sector, our position in the region is growing rapidly. I think that the Eurasia Airshow exhibition, which is being held for the first time this year, will contribute very significantly to future growth. We will attend the show as a participant and we have also invited our colleagues from our related factories to attend. 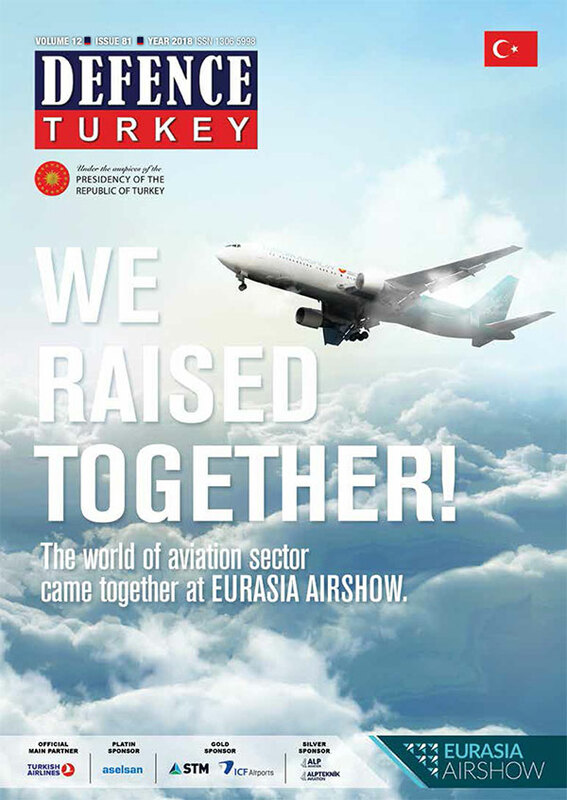 We invite all guests to our Eurasia Airshow stand# 318A. Defence Turkey: What are your R&D activities? Could you please inform us about your new technologies and new products? Our R&D departments work closely on a variety of projects with the R&D departments of the world’s leading companies (Airbus, Boeing, Sikorsky, Lockheed Martin, Aselsan, TAI etc.). According to the requests of our customers’ emerging demands, new connector designs are constantly being developed and manufactured. We continue to increase our diversity by focusing on technological and innovative product ranges. Our facilities which operate in different markets have very strong R&D departments that develop products according to the regional expectations and based on their product ranges. One of our strengths that gives us an advantage is that we can offer a wide range of new and technological product solutions within the framework of our customers’ requests and applications. Our marketing team in Turkey is composed of experienced engineers. We provide technical support and seminars to our customers so that they can choose the right product in a short period of time. We are dedicated to sharing the developments in the connector market and our future technologies that are newly developed in accordance with the specific needs of our customers. Defence Turkey: Could you please discuss the company’s structure, mission and the key areas of Amphenol Turkey? Team work with related facilities is very important for increased efficiency. Balanced & healthy growth in all markets is one of our main targets in our region. We contribute by sharing new technologies, practices and sectoral developments on connector products with both R&D engineers (customers) and related facilities within Amphenol. We also facilitate technical support and coordination amongst our customers and distributors with our facilities. As Amphenol has so many facilities and a large product range, addressing the requests and resolving problems in the quickest and best way possible is one of our key roles. Defence Turkey: Turkey is one of the significant markets for Amphenol, demonstrated through successful collaboration with Turkish firms in the past and with present activities. 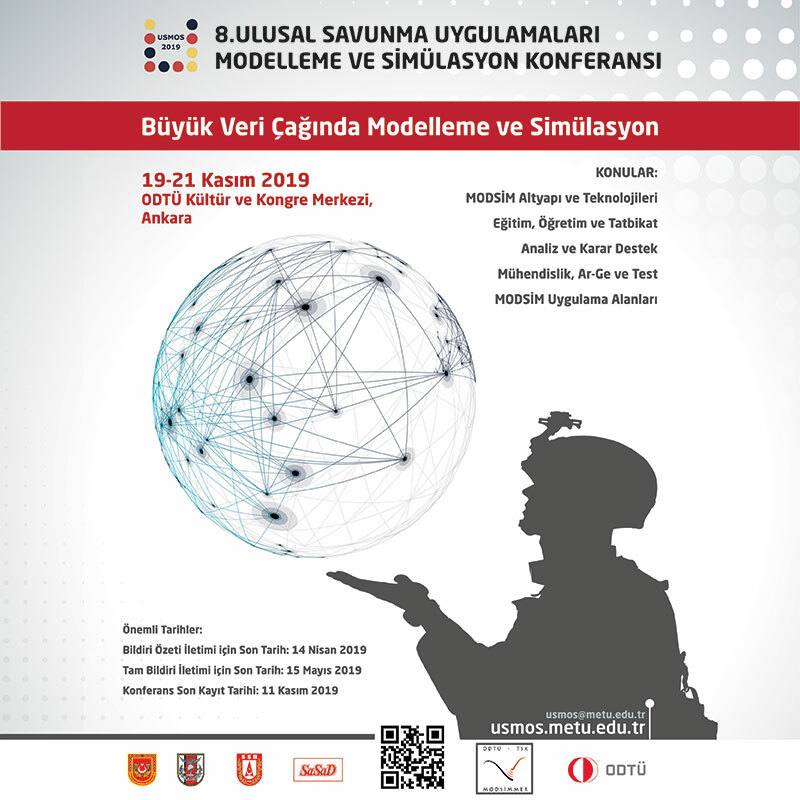 Could you please enlighten us about your activities in Turkey and ongoing programs in the defense, aerospace, civil aviation and naval sectors? We have been conducting our current business as well as design work for many years with our local firms like Aselsan, TAI, Roketsan, etc. Our collaboration has continued to increase over the years in various projects (A400M, T129 “ Atak” Attack helicopter, “Anka” UAV, T625 Multi-Role Helicopter, Ground control units...). 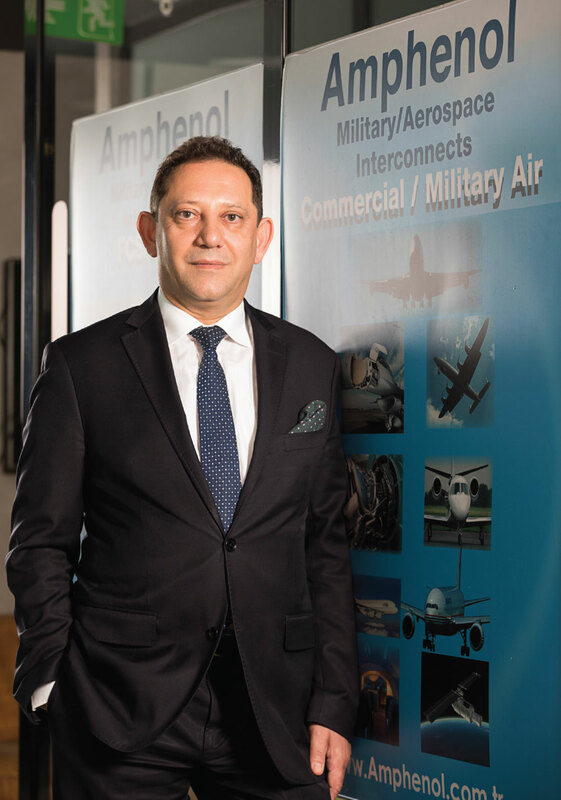 Amphenol maintains its number one position globally with a total revenue of $1.1 billion from the Military and Aerospace Market all over the world. We strive to build on our position as the global leader, to be number one not only in the military and aerospace market, but also in all markets with our service, experience and product variety. Defence Turkey: How do you appraise collaboration with Turkish defense and aerospace companies? We continue to increase our services and sales by improving ourselves according to regional demands and needs with each passing day. We have professional and strong connections with our military and aerospace customers. We arrange regular visits to assess our customers’ needs, complaints and challenges. Based on the customer feedback and our assessment, we work with our AMPHENOL facilities to create long-lasting solutions by sharing information and best practices with our colleagues and all levels of management where needed. Our colleagues from related facilities are regularly travelling to give trainings on their expertise. We are doing our very best to provide the most appropriate solutions toward resolving problems and addressing needs. Looking back on the years 2004 to 2017 in the military and aerospace market, our total sales grew 16 fold in Turkey and 30 fold in our region. We consider this growth as a great result showing successful collaboration with our stakeholders. We rest assured continuing to improve our services through the feedback we receive from our customers. Defence Turkey: Could you please inform us on your future plans for Turkey to expand your presence in the market? As I mentioned before, Amphenol constantly develops its own designs by working with its main customers based on the product ranges that it finds lacking in its own field, or it acquires new companies which will complement the missing product ranges in this respect. Personally, my greatest dream and desire is to establish an Amphenol facility in Turkey for local production which I believe would be a great opportunity and very beneficial both the company itself and our country. Defence Turkey: Finally, would you like to add some final thoughts and give a message to our readers? It may not be feasible for our customers to reach the right products or the right factories quickly amongst a large number of Amphenol facilities; their requirements can vary according to their application and market. We would like to facilitate the connector design for our customers by being their single point of contact that supports them during all stages of their project. Military and aviation products are special products with challenging specs based on various applications. Also, engineers should keep in mind that production lead times for military and aviation products can be long. We always talk about the importance of connector selection for long-term project success. Because no matter how well the performance of the designed electronic devices is, you can only perform as well as the performance of the interconnecting element. Experienced R&D engineers are aware of this detail and they always start working on the connector selection at the beginning of their project.